we would like to invite you to participate in the meeting provided by McKinsey & Company in Poland. 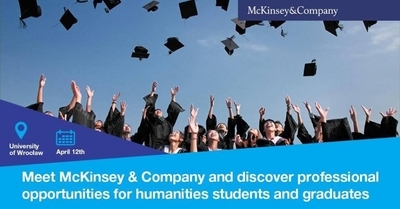 Meet McKinsey & Company and discover professional opportunities for humanities students and graduates. • Can the humanities profile succeed in research & analytics and organization areas? • How can a social sciences background be leveraged in a management consulting environment? • What does a typical working day for an Analyst or Coach look like? • What does the recruitment process look like? Meet us, get answers and discuss! This event is open for all students interested in either research & analytics or organization space of management consulting.